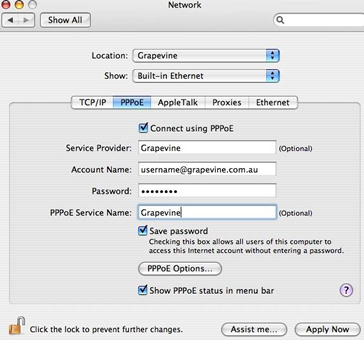 Below are the step-by-step instructions to set up your Mac OS X machine on the TransACT VDSL network. This guide is only applicable if you have a single Mac OS X machine connected directly to the TransACT equipment or supplied Ethernet wall-socket. 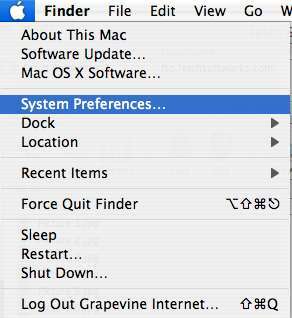 1) Choose "System Preferences..." from the apple menu. 2) Under Internet and Network category, choose Network from the View menu. 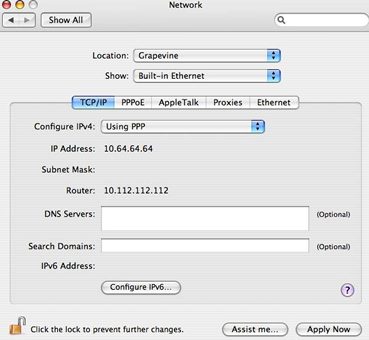 3) Choose Active Network Ports or Network Port Configurations from the "Show" drop-down menu ("Advanced" from the "Configure" pop-up menu prior to Mac OS X 10.1). 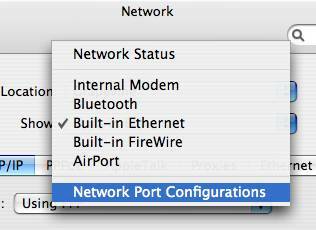 4) Be sure that the checkbox for Built-in Ethernet is selected. 5) Drag Built-in Ethernet to the top of the Port Configurations list to make it the preferred, or primary, network interface. 6) Choose Built-in Ethernet from the "Show" drop-down menu. 7) Click the PPPoE tab. Be sure the checkbox for "Connect using PPPoE" is selected. Enter in the Account Name field as username@grapevine.com.au. If you choose to save your password, try retyping it to be sure that it is correct. Click the TCP/IP tab. Make sure your screen looks like the one below. At the top of the screen, click on the Internet Connect icon and then click Connect. The status will change from "Idle" to "Connecting".